From the standpoint of religion, our family has a diverse background of beliefs. Jamie's mom is Jewish and her dad is Lutheran while Sean is Catholic. As new parents our plan was to teach our child about all of the religions that make them who they are and as they grow they can decide which path or paths they will pursue in life. When Reesa was diagnosed with Krabbe disease we realized that plans had changed. We thought long and hard about how to handle Reesa's spiritual future while doing our best not to offend Reesa's extended family members, many of whom hold their religious beliefs very dear. Ultimately we decided to hold two ceremonies with each celebrating a different, but equally important, side of Reesa's faith. Both ceremonies were celebrated by much of our close family and we're blessed to have these special memories forever. Performed by Rabbi Martin Scharf Reesa received the name Rachel Reesa Mekayla in Hebrew being named after her grandmother Ruth Resa. The Mekayla is for Sean’s father. It was not easy for Rabbi Scharf to find the proper words for this occasion, knowing what’s in the future for Reesa. What he said was loving and moving for the family. The brief service ended with the Rabbi’s blessing to our beautiful baby and her family. Grandpa Mike is so happy for his Angel Reesa Michaele . And so proud to be part of such a loving and understanding family. I have said this before but it always takes my breath away at the shear physical beauty of your child. She is just striking. I hope these ceremonies brought your family much peace. Mazel Tov! It was good that you had both ceremonies. Thank You both so much for sharing these most precious photos. What a wonderful family and such a precious angel.. She is so beautiful. Such a beautiful family! Thank you for sharing your special days! 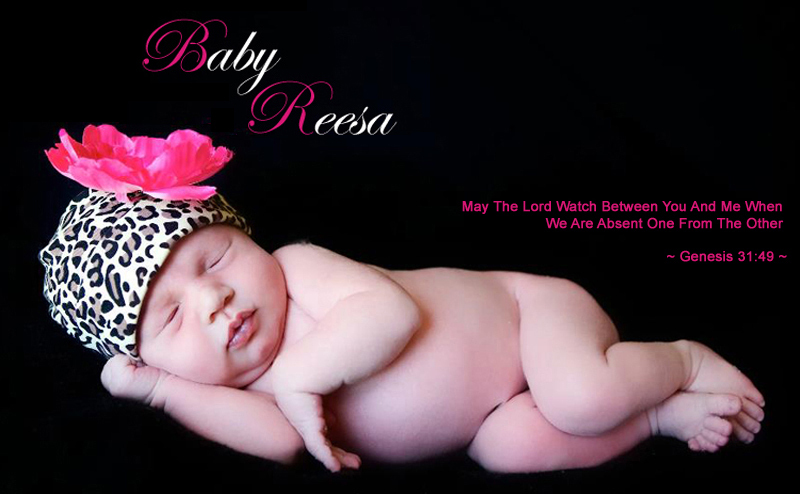 Reese is such a beautiful baby! I love your updates and have you all in my prayers continuously. God Bless your family.